The James Webb Space Telescope will finally crack the mystery of Tabby’s Star. We think. The faraway star KIC 8462852 has been a fervent topic of debate over the last few months, ever since folks at SETI proposed that maybe—just maybe—a there was a giant alien megastructure around the star responsible for the weird readings scientists had been getting. Since then, most people have come to accept the more ordinary explanation that comets are responsible for the space oddity. But it turns out the NASA’s next great observatory, the James Webb Space Telescope, could be just the thing to answer this kind of question for sure. The hubbub all started last October when NASA’s Kepler planet-hunting telescope found a strange phenomenon around a sun-like star. Something was blocking out 20 percent of the light from KIC 8462852, since nicknamed “Tabby’s Star” after discoverer Tabetha S. Boyajian. A planet even the size of Jupiter or larger should have blocked out only 1 percent of the light. That suggests something big is here, and no Earth-based telescopes detected heat coming from whatever was blocking the light, meaning it wasn’t a planet or an asteroid. The lead hypothesis has been, and remains, that comets are blocking out the light. A swarm of them may have collided and created a giant cloud of icy-cold debris. But even that doesn’t quite tell the whole story. For one thing, astronomers still can’t explain how there would be a cloud of comets big enough to block out that much light from a mid-sized star. It would require more mass than is found in our solar system’s entire Kuiper Belt, the region of objects that includes Pluto, an unlikely scenario. That’s where the megastructures came in—a longshot but intriguing idea. Scientists have long theorized that advanced alien civilizations might begin to harness all the power of their home star, requiring massive powerplants known as Dyson Spheres or Dyson Swarms, named for Freeman Dyson. Dyson first proposed these structures, and none have been found to date, of course. Otherwise we’d know for sure we weren’t alone. If there was a Dyson Swarm somewhere out there, it would look a lot like what’s happening around Tabby’s Star. Observations from Berkeley SETI and the SETI Institute turned up nothing, but investigations continue. The lack of any radio signals or light flashes dimmed the hopes of this hypothesis, though it hasn’t entirely squashed the small chance alien intelligence is at play. The debate will go back and forth among space lovers, there may be a final answer in the next decade. The James Webb, set to launch in 2018, should be able to tell whether comets, an alien megastructure of Dyson Spheres, or something we’ve never seen before is responsible for this weird sighting. That’s according to Mark Clampin, director of the Astrophysics Science Division at Goddard Space Flight Center. “Webb is able to make observations of transiting exoplanets, so it’s extremely well equipped to make these kinds of observations,” Clampin said in a phone call with Popular Mechanics. So why is Webb better than anything else out there? It’s not just the size of the telescope. It’s that the follow-on mission to the Hubble Space Telescope will have infrared capabilities far exceeding anything out there right now. Currently, there’s only one space telescope capable of infrared observations of the kind needed to crack this mystery, and that’s Spitzer Space Telescope. While Spitzer was once a titan of infrared observation, it’s since lost the cooling fluid that made it capable of those observations without thermal problems. Spitzer, which remains in its Earth-trailing orbit, is still useful for making near-infrared observations. It’s not as useful in the mid-infrared range, which is exactly where Webb can thrive—in a range of light wavelengths from 5 microns to 28 microns. With those sorts of sensitivities, Webb would be able to suss out even small signals from whatever is orbiting Tabby’s Star if it crosses the surface of the star again. 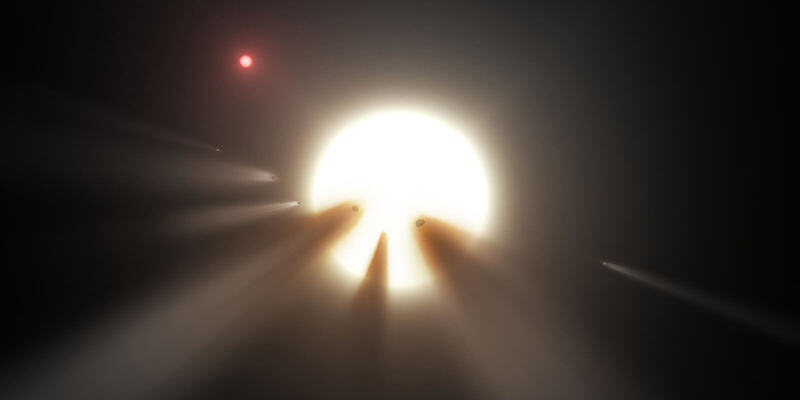 “If any material that’s blocking the light or anything but the star itself, there should be an excess of infrared,” said Daniel Angerhausen, a postdoc at NASA Goddard who recently cast doubt on a hypothesis that Tabby’s Star had dimmed over the last century. When the object passes across the surface of the star, that spectral signature should give an idea on the shape of the object, including whether we’re looking at a solid object of just a dust cloud of some form. If it appears “noisy and unstructured” it may be a cloud of debris. If it appears solid, it may be a fragment of cosmic collisions that just haven’t shown through our infrared readings yet. And if it appears to be cube shaped or otherwise unnaturally angular? Then maybe it’s aliens. But neither Angerhausen or Clampin are counting on it. “The last resort is the alien megastructures, and there are so many unknown natural things that we haven’t seen,” Angerhausen says. “It takes us a very long time to get to the point where we start thinking about the non-standard things that might be going on,” Clampin added. Disappointingly, an enormous structure built by extraterrestrials probably is the least likely explanation for the odd data from Tabby’s Star. But for scientists and space-lovers and people who hope aliens exist, there’s still reason to be excited. Even if Tabby’s Star’s great occulter is something totally natural, it may be a natural phenomena we’ve never seen before. And as Angerhausen points out, while there may not be aliens around the star, we’re at a point in time when the technology to thoroughly ask and investigate that question is starting to exist. “We are getting closer to the technology we need to do that, actually,” he says. There’s still the matter of allotting telescope time on Webb, a process that will begin next year. Webb stakeholders will get a first pass at telescope time before it opens up to the wider community. Given the interest in Tabby’s Star, it’s likely that someone will ask for time. That means an answer will come in the next decade, more than likely.